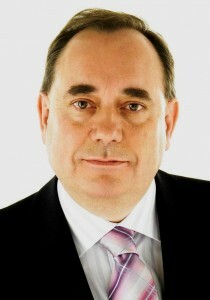 Below is the text of the speech made by Alex Salmond, the Scottish First Minister, on 22nd October 2011. Firstly Scotland has many friends internationally. People cheering us on and wanting us to do well. That international reach is a great asset for this country. Secondly climate change is perhaps the greatest issue facing this planet. The responsibility of the Scottish Parliament for it is almost accidental. It wasn’t even on the agenda back in 1997 and therefore wasn’t specified as reserved in the Scotland Act. As a result it was devolved. So given that by international acclaim we have handled this mighty issue so well as a parliament, what possible argument could there be that the Scottish Parliament is not capable of discharging ALL of the issues facing the Scottish people. I also wanted to say a word about Scotland’s late national poet Eddie Morgan. A man whose modesty as an individual was matched by his brilliance as a poet. He didn’t wear his politics on his sleeve but he has left this party a financial legacy which is transformational in its scope, and Angus Robertson will spell that out tomorrow.. However his real legacy is to the world in his body of work. Delegates by your applause let us salute our Makar Edwin Morgan. When I was cutting my teeth in politics in West Lothian the late Billy Wolfe once told me that the SNP stood for two things – independence for Scotland and home rule for Bo’ness! In reality the SNP does stand for two fundamental aims – and these are enshrined in our constitution – independence for Scotland and also the furtherance of all Scottish interests. These are our guiding lights and they are equally important because they reflect the reality that our politics are not just constitutional but also people based. Mind you it was designed by the Labour Party so we should not be too surprised that their cunning plan didn’t work. What I said on election night was that after almost 80 years we had lived up to the name of one of our founding parties – east, west , south and north. It is a good phrase “the community of the realm”. It was developed in mediaeval Scotland to describe a concept of community identity which was beyond sectional interest. The best Scots term for it would be the common weal. It does not ignore the fact that sometimes as a Government we have to take sides within Scotland, as well as taking Scotland’s side.Particularly when times are tough we have to ask the rich to help the poor, the strong to help the weak, the powerful to help the powerless. But we do so in pursuit of the common weal, the community of the realm. We love Scotland but we don’t believe our country is perfect. We seek to make it better. We know that in building the new Scotland we must confront our demons from the past like sectarianism and our problems from the present like the abuse of alcohol. Some people say tackling these things is unpopular. But the election told us that the people respect and understand that sometimes it takes guts to govern. But we shall always govern for that common weal..
We govern – we have governed – wisely and will continue to do so. We have sheltered the community from the economic storms in so far as it is in our power to do so. Our people – our community – face a hugely difficult position – a squeeze between falling incomes and rising prices. To help family budgets we have frozen the council tax for FOUR years and will continue to freeze it through this coming parliament. Labour say we shouldn’t do this. Really! And then we would have the same 60 per cent rises as when they were in power. A Council tax rise of £680 for a band D property. To help family budgets we have held down water rates. The Liberals say that we should privatise water. Really! And then we would have been as powerless to act on water bills as they are right now on energy bills. To help family budgets we have abolished prescription charges. The Tories say we shouldn’t do this. Really! Tell that to the 600,000 Scots on incomes of only £16,000 who were forced to pay for their medicine. Every household bill which is under our influence, we have tried to control. Every household bill under UK influence is out of control. In Scotland we have a prices and incomes policy. In England the Tories control incomes – except of course in the boardroom- but not prices. None of these things- the freeze on the Council Tax, the ending of prescription charges, the stability of water bills, are easy. BUT THE RECORD SHOWS THAT THE ONLY PARTY AND THE ONLY GOVERNMENT ATTEMPTING TO HOLD DOWN HOUSEHOLD BILLS IS THE SNP GOVERNMENT. The unionist parties have lost touch with the people. Labour and Tories are parties without a leader. The Liberals have a leader without a party. We govern well. They oppose badly. IN THE ELECTION THE PEOPLE DECIDED THAT LABOUR WERE NOT FIT FOR GOVERNMENT. RIGHT NOW THEY ARE NOT FIT FOR OPPOSITION. Governing well makes a real difference to real people. Back in 2007 we said we would put 1000 extra police on the streets and communities of Scotland. Labour said it couldn’t be done. And the result has been a 35 year low in recorded crime in Scotland. I’ll just repeat that. Recorded crime in Scotland is at its lowest since 1976 when Jimmy Carter was elected President of the United States and Jimmy Saville was presenting Top of The Pops. Earlier this week a poll showed that peoples FEAR of crime in Scotland was running at almost HALF of the level in the rest of the United Kingdom – 28 per cent against 48 per cent. Much of that success is down to the extra police officers. We are the SNP. We believe in freedom. But the freedom of people from the fear of being mugged or robbed is a key objective of this Government and the 1000 extra police in the communities of Scotland is a substantial part of achieving that objective. LET THERE BE NO MISTAKE. OUR REFORM OF THE POLICE SERVICE IS ABOUT PROTECTING THE FRONT LINE SO THAT THE FRONT LINE CAN PROTECT THE PUBLIC. Right now our focus is on jobs and the economy. John Swinney and his team spend every waking minute seeking to encourage our own businesses to grow and to attract new companies to Scotland. We have the most competitive business tax regime in these islands. 80,000 small businesses either pay no business rates or have a substantial discount. We know, as they do, that their success holds the key to job creation. We will continue to offer that crucial incentive throughout this Parliament. LET US BE CLEAR. THE SMALL BUSINESS BONUS STAYS IN SNP RUN SCOTLAND. In the last few months a procession of major international companies have chosen Scotland as the place to conduct their business. From Amazon, Mitsubishi, Doosan, Gamesa, Vion, Avaloq the message has been the same – Scotland has the people and the resources to allow them to conduct their international operations from a Scottish base. And what have the UK Government been concentrating on while we focus on jobs and investment? They have formed a Cabinet sub Committee to attack Scottish independence. Let’s get this right. Cameron, Clegg, Osborne and Alexander sit in a committee working out how to do down Scotland and they engage in this while the European Monetary system teeters on the brink of collapse, while the jobless total in England is at a 20 year high and inflation more than double its target. And these politicians wonder why they carry no confidence among the people of England never mind the people of Scotland. OUR MESSAGE TO THIS QUAD OF MINISTERS: STOP ATTACKING SCOTTISH ASPIRATIONS AND START SUPPORTING ECONOMIC RECOVERY. We need more capital investment not less, finance for companies and price and job security for the people. And what is their grand strategy to restore their flagging political fortunes? To have more Ministerial day trips to Scotland. *CONFERENCE EVERY TORY MINISTER WHO COMES NORTH PUTS ANOTHER 1000 VOTES TOWARDS THE NATIONAL CAUSE. Of course these visits to Scotland are selective. Very selective. Last week the Prime Minister came to Scotland to hail the billions of investment in the new oil and gas fields off the western approaches. However there was no sign of a Prime Ministerial visit this week when his Government betrayed the future of Longannet. Over £13 billion from Scotland’s oil and gas in the course of this year but not even a tenth of that to secure the future of the clean coal industry in Scotland. Not even one tenth of one year of oil and gas revenues to secure a world lead in planet saving technology. When he was making the BP announcement David Cameron claimed his geography teacher at Eton had told him that all the oil would be gone by the turn of the century. The Prime Minister’s memory is faulty. It wasn’t his geography teacher. It was successive Labour and Tory Governments. Like Margaret Thatcher’s Energy Minister who claimed oil was declining in 1980! Now the cat is well and truly out of the bag and we know that oil and gas will be extracted from the waters around Scotland for at least the next 40 years. Can I therefore put forward this simple proposition. After 40 years of oil and gas Westminster had coined in some £300 billion from Scottish water – around £60,000 for every man women and child in the country. The Tories’ own Office of Budget Responsibility figures suggest another £230 billion of oil revenues over the next 30 years – and that was before the latest announcements. LONDON HAS HAD ITS TURN OUT OF SCOTTISH OIL AND GAS. LET THE NEXT 40 YEARS BE FOR THE PEOPLE OF SCOTLAND. Scotland has the greatest array of energy resources in Europe. Oil, gas, hydro, wave, wind and tidal power and clean coal..
On Thursday I went to Nigg to announce the redevelopment of that great fabrication site. Once again thousands of jobs can be developed there as marine engineering comes alive in the Highlands. Today I am announcing a further important development on our journey to lead the world in wave and tidal power. A new £18 million Fund to support marine energy commercialisation. This will support the deployment of the first commercial marine arrays and the scaling up of the devices currently on test in Scottish waters. And this is part of a £35 million investment over the next three years which will support testing, technology, infrastructure and deployment. TODAY SCOTLAND IS LEADING THE RACE TO DEVELOP OFFSHORE RENEWABLES. WITH THIS ANNOUNCEMENT, OUR NATION IS MOVING UP ANOTHER GEAR. THE MESSAGE IS CLEAR. IN MARINE ENERGY SCOTLAND RULES THE WAVES. Conference, right now some two thirds of wave and tidal projects in Europe are in Scottish waters. That will soon be three-quarters. The announcement by Kawasaki Heavy Industries on Thursday of their intention to test in the Orkney Islands underlines the international impact that Scotland is now making. And as we develop wave and tidal commercially in our waters then we will export that technology across the planet. Our objective in wave and tidal power is to have not just demonstration projects but hundreds of mega watts of electricity by 2020 -enough to power half a million Scottish homes. The green re-industrialisation of the coastline of Scotland is central to our vision of the future. And the jobs impact will be felt from Machrihanish, to the Clyde, to Leith, to Methil to Dundee to Aberdeen and the North East ports to the Moray Firth, to Nigg and the Highlands, from Orkney waters to Arnish in the Western Isles. Onshore wind power has one serious drawback. And that is, only little of the fabrication is home based. Despite the fact that the first modern wind turbine was demonstrated in Marykirk Aberdeenshire in 1887 the technology of the onshore industry was exported to Denmark and Germany more than a generation ago. However we can do something about our offshore renewable opportunity. Our objective is that Scotland will design, engineer, fabricate, install and maintain the great new machines which will dominate the energy provision of this coming century. THAT IS OUR VISION FOR SCOTLAND AND WE SHALL GET THERE. And in doing so we will create jobs and opportunity and hope for young people of Scotland. It is the inescapable responsibility of this Government and indeed of every adult Scot to help tackle the scourge of youth unemployment. Employment among Scottish youngsters is almost five per cent higher than elsewhere in these islands. We have a near record of school leavers going on to positive destinations of a job, apprenticeship or full time education. However this is not enough. Youth unemployment is still far too high. So this is what we are doing and this is what we shall do. First apprenticeships. There will be 25,000 modern apprenticeships in Scotland – 60 per cent more than when we took office -not just this year but every year – and in Scotland remember every single youngster on a modern apprenticeship is in a job. Secondly every major contract or grant from Government will now have an apprenticeship or training plan attached to it. For example when Vion chose Broxburn as their centre of excellence for food production there were 50 modern apprenticeships among the new jobs. Thirdly every single youngster who is not in a job or full time education or an apprenticeship will be offered a training opportunity. That is every single 16-19 year old under Opportunities For All. Fourthly we shall ensure that university and college education remains free to Scottish students. We now have more world-class universities per head than any other nation on the face of this planet. AND THANKS TO THIS PARTY THAT OPPORTUNITY WILL REMAIN AVAILABLE TO YOUNG SCOTS ON THE BASIS OF THE ABILITY TO LEARN NOT THE ABILITY TO PAY. AND TODAY I AM ANNOUNCING A FURTHER MOVE. COMPANIES IN ENERGY SECTOR ARE REPORTING SKILL SHORTAGES. THEREFORE OVER THE NEXT FOUR YEARS WE ARE DELIVERING 2,000 MODERN APPRENTICESHIPS SPECIFICALLY FOR THE ENERGY INDUSTRIES. HOWEVER WE WILL ALSO NOW PROVIDE AN ADDITIONAL 1,000 FLEXIBLE TRAINING PLACES FOR ENERGY AND LOW CARBON. REAL OPPORTUNITIES FOR OUR YOUNGSTERS IN THE SECTORS WHICH WILL SHAPE THE INDUSTRIAL FUTURE OF OUR COUNTRY. We cannot wipe every tear from every cheek but we can try. And everything we do will reflect the common weal of Scotland. The best way to get people back into work is through capital investment. That is why John Swinney has diverted funds to sustain economic recovery. That is why we have created the Scottish Futures Trust to gain value for money. Major contracts sponsored by the Scottish Government are now delivered on time and on budget. And this gives me the opportunity to make a further announcement today. Two years ago we set out plans for a new school building programme in Scotland. Led by the Scottish Futures Trust, our investment was to deliver 55 new schools. Already 37 schools have been committed in the first two phases. Conference, the Scottish Futures Trust has levelled the playing field in public sector construction contracts. We have sunk the PFI and replaced it with value for money programmes. THAT ACTION HAS ALLOWED US TO DELIVER OVER 3O0 NEW OR REFURBISHED SCHOOLS IN THE LAST FOUR YEARS. AND THAT’S WHY TODAY I AM ABLE TO TELL YOU THAT THE NEXT PHASE OF OUR NEW SCHOOL BUILDING PROGRAMME WILL BE ABLE TO DELIVER 30 NEW SCHOOLS ACROSS OUR NATION. A DOZEN MORE THAN PREVIOUSLY PLANNED. DELEGATES IN THE FACE OF WESTMINSTER CUTBACKS THE £2.5 BILLION NON PROFIT DISTRIBUTION PROGRAMME IS CRUCIAL TO ECONOMIC RECOVERY. NONE OF THAT WOULD HAVE BEEN POSSIBLE IF WE HAD ALLOWED THE PFI RIP OFF TO CONTINUE. THAT IS WHAT GOOD GOVERNMENT IS ALL ABOUT. We face a winter in this energy rich country of ours where people will be frightened to turn on their heating. Fuel poverty amid energy plenty. What a miserable, disgraceful Wesminster legacy for our energy rich nation. Fuel poverty amid energy plenty. If there ever was an argument for taking control of our own resources then this must be it. The Prime Ministers fuel summit was little more than hot air. We don’t control the energy markets but we can and will do something to help. WE’VE EXPANDED OUR ENERGY ASSISTANCE PACKAGE TO INCLUDE THOUSANDS OF SCOTTISH CARERS. AND CONFERENCE, BY 2015 THE SCOTTISH GOVERNMENT WILL INCREASE OUR FUEL POVERTY AND ENERGY EFFICIENCY BUDGET BY ONE THIRD. BECAUSE OF THIS INVESTMENT I AM ABLE TO MAKE A FURTHER ANNOUNCEMENT. A FEW MOMENTS AGO YOU HEARD PREMIER RANN OF SOUTH AUSTRALIA PRAISING OUR OFFER OF ENERGY EFFICIENCY MEASURES TO HALF A MILION SCOTTISH HOUSEHOLDS. I CAN NOW TELL YOU THAT BY APRIL OF NEXT YEAR THAT 500,000 WILL BECOME 700,000. ENSURING 200,000 MORE SCOTTISH FAMILIES GET THE HELP THEY NEED TO HEAT THEIR HOMES IN THIS ENERGY RICH COUNTRY. On the way to Inverness I noticed an outdoor company called ‘naelimits’. No limits is a beautiful idea, and somehow it carries more punch in Scots. Nae limits to your ambition, your courage, your journey. Nae limits sums up the spirit of freedom which many of us take from our magnificent landscape, and which we wish for our society and politics. No politician, and certainly no London politician, will determine the future of the Scottish nation. Mr Cameron should hear this loud and clear. Twenty years ago when Scotland faced a previous Tory Government a cross party group drew up a Claim of Right for Scotland. This is what it said. But we had no Parliament then. But we have now, and next month I will ask Scotland’s Parliament to endorse anew Scotland’s Claim of Right. THE DAYS OF WESTMINSTER POLITICIANS TELLING SCOTLAND WHAT TO DO OR WHAT TO THINK ARE OVER. THE SCOTTISH PEOPLE WILL SET THE AGENDA FOR THE FUTURE. Robert Kennedy once said, ‘the future is not a gift, it is an achievement’. That is true for Scotland as for any nation. Our future will be what we make it. The Scotland Bill isn’t even enacted yet it lies in the past. Unloved, uninspiring, not even understood by its own proponents. The UK Government haven’t even gone through the motions of considering the views of the Scottish Government, the Scottish people, the last Scottish Parliament Committee, the current Scottish Parliament Committee -total negativity to even the most reasonable proposal to strengthen the Bill’s job creating powers. THE RESPECT AGENDA LIES DEAD IN THEIR THROATS. This is Westminster’s agenda of disrespect – not of disrespect to the SNP but of fundamental disrespect for Scotland. The Tories and their Liberal frontmen have even taken to call themselves Scotland’s other Government. A Tory Scottish Government? If Murdo Fraser thought such a notion was conceivable then he would’t be trying to disband the Party! In contrast fiscal responsibility, financial freedom, real economic powers is a legitimate proposal. It could allow us to control our own resources, introduce competitive business tax, and fair personal taxation. All good, all necessary but not good enough. We have the talent, resources and ingenuity . The only limitations are our imagination and our ambition. So give Scotland the tools, put the people of Scotland in charge and see our nation flourish as never before. Let us a build a nation that reflects the values of our people. With a social contract – and a social conscience – at the very heart of our success. The society, the country, that Scotland desires, that Scotland believes in – it is not a country or a future on offer from the Tory government down south. Even that one institution which really made Britain great – the National Health Service, – is being dismantled in England. We are committed to winning Independence for Scotland. And we are pledged to the furtherance of all Scottish interests. Both are in our DNA. It is who we are and what we are for. They are what makes us Scotland’s National Party. And it is more than a name – it is an attitude. Over these past three days, at this conference, I have seen that passion and belief in action. We are a party with a mission, because we know Scotland’s cause is great and we know Scotland’s need is great. Let us have our own debate about our own future on the timescale which was endorsed by the people in May. And let us decide it in a proper fashion. Our task is to work – to convince the people of this nation that we can do better. To work at building a society which is not simply better than today’s, but a beacon of justice and fairness to the world. All these things will come from hard work, from toil and from sweat. Look around you, look at where we stand. And tell me this was easy – it was not. This was eighty years of hard work. We stand where we do because of generations before us, because of party workers and campaigners who never saw this day. And we shall prevail – because we share a vision. A vision of a land without boundaries. Of a people unshackled from low ambition and poor chances. Of a society unlimited in its efforts to be fair and free.